First lets gaze at the beauty of the Ludwig Classic Maple Black Oyster Pearl kit that has been in my life for almost 4 years now. I decided finally this last year to put the beloved Remo-Roto Toms into storage and replace them with 10 and 12 inch single headed concert toms. They have been affectionately dubbed ” The Henley’s” for their high pitched resemblance to a certain drummers toms on a certain classic rock staple that cant be mentioned by name. With the left side 15 inch floor/ rack tom included, I now have more to do on the left side of my body than I know what to do with. But this made for some adventures in drum part composition that I didn’t expect, and some much longer fills and open handed flams on the 15 and 16 floor toms on either side for more power. And more power is always a good thing. Mixing up the Sabian Paragon crash and rides with AAX Metal Crashes and my Swiss Cheese cymbal ( The Sabian O-Zone Crash) and I have all I need to make lots of good noises..still trying to convince my band mates I need a China Cymbal..but no budge yet. 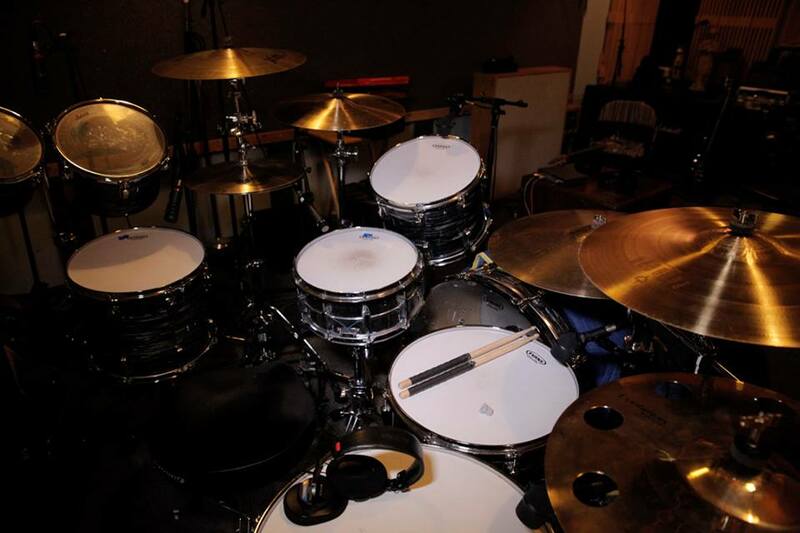 So this would be the kit that all the new songs would be written with. And so began us having to keep a secret from everyone about even the remote possibility of this happening. When we went into the studio to record everything, we didn’t plan on Alex putting anything down as we didn’t know if his schedule would actually permit it. So we managed to do the entire bed track of what was to become “Il Mostro Atomico” just figuring it was NOT going to happen. 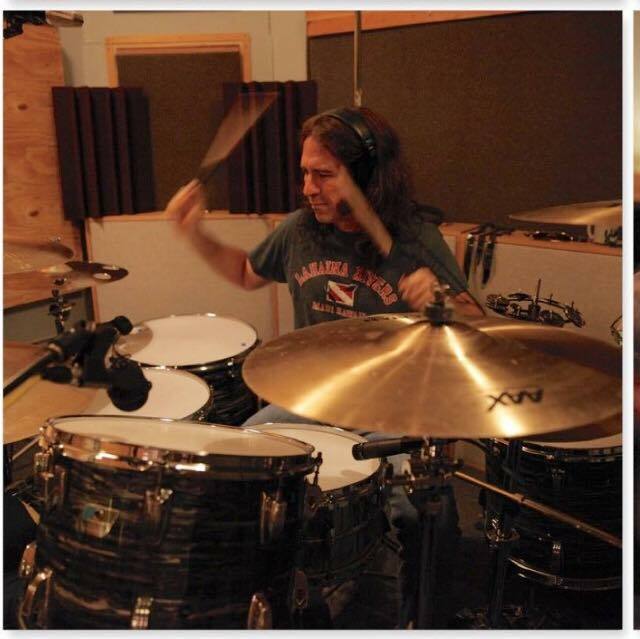 It was a great tracking session with the drums going down in 2 takes . We also laid down “ Nowhere Left To Hide” and “Intelligent Worship” in the big room at Susstudio in Simi Valley with Andrew Giacumukis and then moved on to track “ (Ive Been) Hexed”, “ Don’t Panic”, “ Slower Than Light”, “ Clone of The Universe” and one more song that didn’t make the cut with Jim Monroe at The Racket Room in Santa Ana. All of the rest of the percussion for ” Il Mostro Atomico” was added as well, with yours truly on congas, shakers, wind chimes, fish, vibra slap, tambourine and Brad Davis on triangle. It was also during these sessions that we finally got the email from Alex saying that he had a window of time that he could do the session in. So off the tracks went to him and soon enough I was sitting upstairs at home, opening his sessions and listening to what he had done. To say I was excited and blown away is an understatement. It was pure Lifeson magic; melodic, noisy, tasteful and most of all compositional. All of the things that have made me love his playing for 40 years. And here it was sitting in OUR song. If you would have told me when my parents friends gave me my first vinyl of “Caress of Steel” (together, they also gave me KISS “ Alive”..way to corrupt the youth!!) 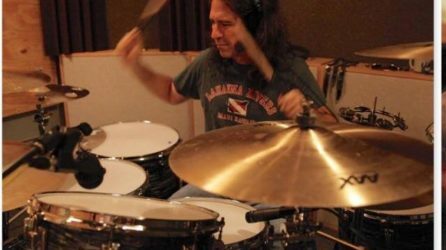 that the guy ripping “ Bastille Day” and “Lakeside Park” would be playing on my bands album some 35 years later I would have said “you’re crazy, I’m going to be a marine bioligist, not a drummer! !” Life goals…there’s still time maybe? So again the clock ticks and we wind up missing our own imposed deadline, with shows booked for November 2017 that were supposed to be album release shows. With mixing, mastering and artwork to do we will never make it. In the middle of all of this, Alex was kind enough to actually record more material that we were not able to use because having reached our cut off. Sadly we just had to put a finish date on the record to even get it out in early 2018. 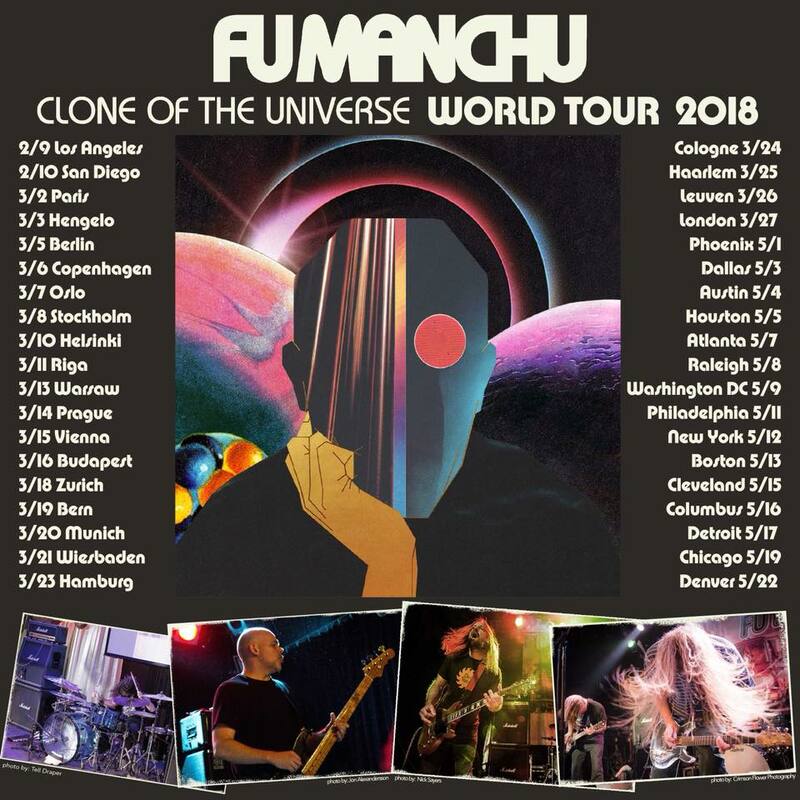 Thus…we have “Clone Of The Universe” coming out February 9th 2018 and we are more than excited to play as much of it as possible live, including all of “ Il Mostro Atomico” which clocks in at 18:08. The same exact running time as side one of my favorite RUSH albums, “ Hemispheres”. Maybe we can get Alex to join us on the road somewhere to jam on it…but for now Bob has to learn Alex’s parts. Not a bad job to have!! So in the coming months I will be putting more videos and lessons here. Neal Burns, trusty Inter-Web captain and Barstow Boyz bass player and myself thought it time for a website re-design. Hope you enjoy it, take a look around if you haven’t been here before. 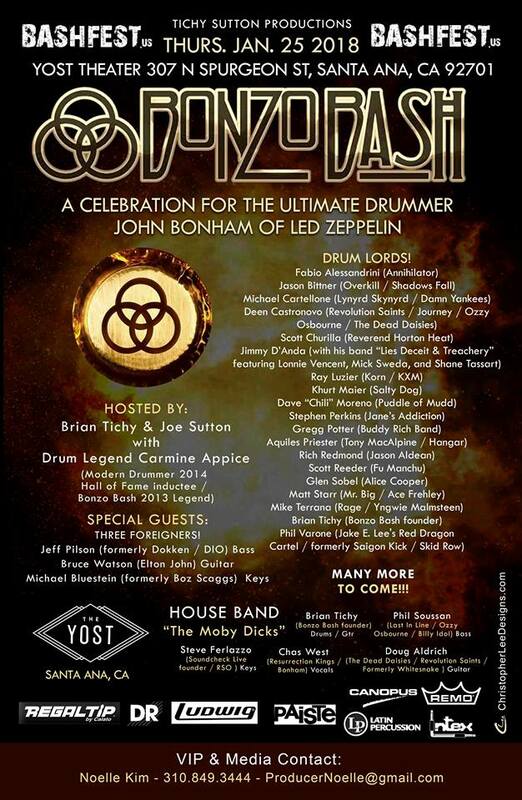 The great Brian Tichy (Whitesnake, Foreigner) has been kind enough to include me in this years “ Bonzo Bash” at The Yost Theatre in Santa Ana in January 25th the first night of NAMM 2018, as myself and a myriad of other drummers play tribute to master John Henry Bonham for a night of Led Zeppelin music. 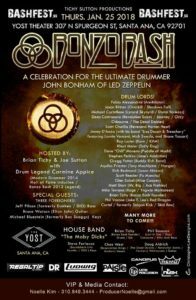 Check out the who’s who on the poster below! 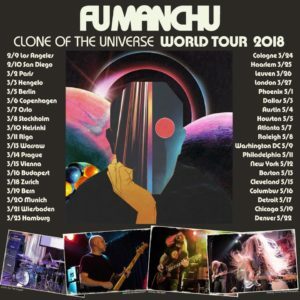 Then the first shows of the “Clone Of The Universe” World Tour get under way in LA and San Diego before we head to Europe and the rest of America, keeping us busy until at least June, before even more dates yet to be announced….so road blogs, video lessons, show footage..all of it coming soon!